Designed to coordinate with each other and with other elements in the space, they help simplify the finishing process of Johnsonite Corner Guards, Johnsonite Wall Base and Johnsonite Stair treads. The true beauty of Millwork, however, could be the cost savings versus real wood. Lower initial costs combined with ongoing maintenance savings makes Millwork a high-performance solution that helps boost productivity and ROI. Use our A408 Mapei Adhesive. Flexible PVC and proprietary thermoplastic rubber formulation designed specifically to meet the performance and dimensional requirements of ASTM F-1861 Standard Specification for Resilient Wall Base, Type TP, and Group 1. 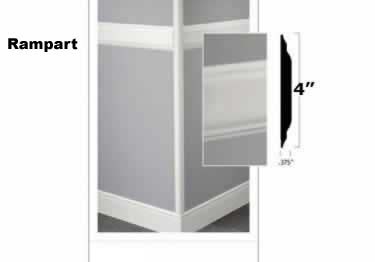 Can I use this product over vinyl wall covering? For the Johnsonite Millwork Chair Rail Ideas - #A426, can we buy that in individual pieces or do we have to buy it by the case? What is the length of each piece? we may be installing the johnsonite millwork chair rail ideas-#a426, would we have to support it or would taping it to the wall during dry time suffice? How is this installed? Does it come with an adhesive backing? Can I get a sample before purchasing to help match another color? Can this be adhered to painted block walls? Johnsonite® Millwork Chair Rails comes the Rampart design and an assortment of 100 colors, lasts longer then wood and never scratches or dents. We use this item to protect walls in Doctors waiting rooms. We had ordered the wrong item. Received a phone call and had the correct item exchanged. Awesome service!